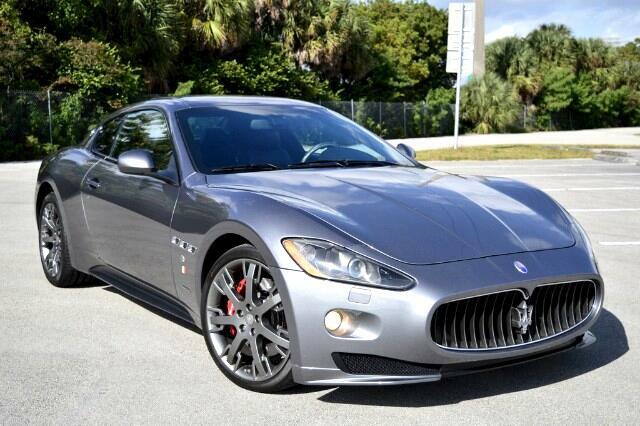 2010 Maserati GRANTUSRISMO S MC, Grigio exterior with NERO leather interior, Red leather stitching, 4.7L 433HP V8 engine, Aerodynamic Package CARBON FIBER, SINGLE rate suspension, MC Aluminum Drive Pedals, NEPTUNE Mercury Gray 20 inch rims, Carbon Fiber Door Sills, Carbon Fiber trunk spoiler, Multi function SPORT Steering wheel, 10 way power heated front seats, Full Leather interior, Dual zone climate control, Skyhook electronic suspension, Anti theft alarm system, Cruise control, 11 speaker BOSE surround sound system, Multimedia system with 7 inch screen display, Satellite Radio, 30GB Hard drive Navigation with Jukebox, Voice control Bluetooth system, Bi-XENON headlamps with curve illumination, LED technology tail lamps, black Alcantara headliner, Gloss RED brake calipers, Pirelli tires, Carbon Fiber interior accents, Carbon Fiber steering wheel, SPORT mode exhaust system, and more. Visit Miami Imports online at www.miamiimports.net to see more pictures of this vehicle or call us at 305-688-4777 today to schedule your test drive. You can speed up financing through our website (www.miamiimports.net). Send us your application today, we will work hard to get you the best deal possible before you travel to our location. We know your time is valuable. No one wants to spend a whole day sitting around at a dealer. We won't hold you up for hours. We don't buy or sell neglected vehicles, we only buy well kept and maintained inventory. We ship vehicles anywhere in the world, we simplify out of state purchases. We can provide an extensive amount of information if you decide to buy sight unseen. You are responsible for buying your vehicle sight unseen. We can send lots of pictures per your request. We do not carry off sight vehicle inspections, our insurance policy does not allow for. Call now for more information, our phone lines are open past our business hours. Message: Thought you might be interested in this 2010 Maserati GranTurismo.